Apart from Pakistan, the governments of rest of the world honor the tax payers because they have rights which they exercise incase government gets their hard earned money involved in fruitless or expensive activities. 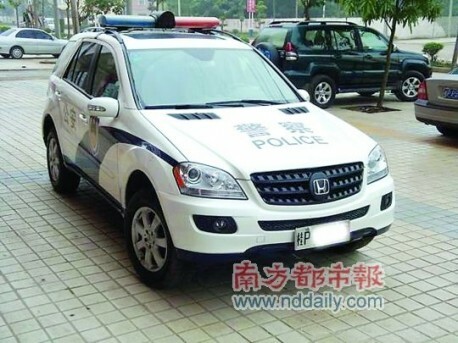 In Fangchenggang (part of Guangxi Province), Police tried to avoid the rage of tax payers for buying an expensive luxury vehicle as a Police car, through swapping its Mercedes Benz ML-350 stickers and replacing them with Honda CR-V stickers but the citizens weren’t going to be fooled that easily. It has been reported that there has been a lot of criticism in China on the local governments wasting tax payers money therefore the police tried to fool the public by replacing stickers of an ML350 reportedly costs around 900,000 yuan (US $139,000), which is a lot more than Honda CR-V, which runs around 200,000 yuan (US $30,000). Citizens correctly identified the failed disguise of the Police and posted the pictures on the web sparking anger amongst the citizens causing ridicule on the government for fooling the tax payers on the use of their money and the best part was, carnewschina reported that police denied changing the stickers or anything on the car.